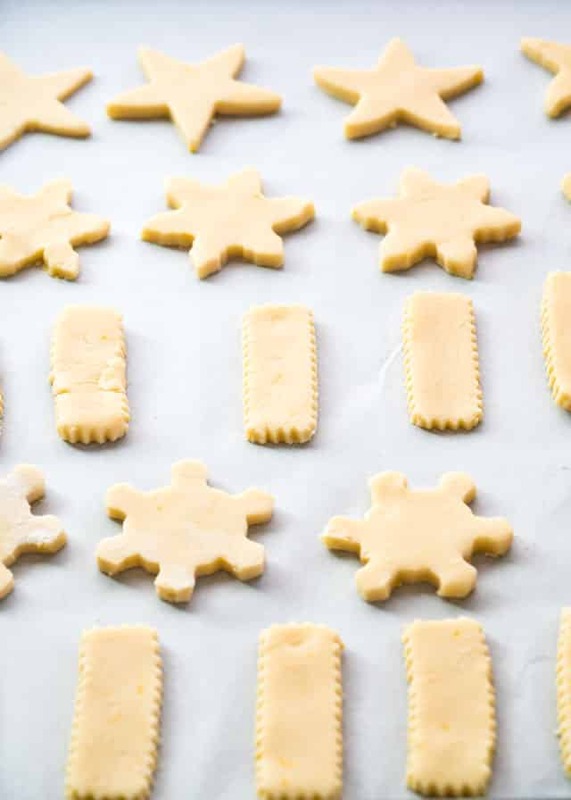 Lemon Shortbread Cookies – Classic shortbread with a lemony twist. Using only 4 ingredients and festive decorations, fill your house with the wonderful aroma of Christmas just in time for the holidays. I hope you guys are baking along with me because I’ve been having loads of fun. If you enjoy baking as much as I do, let’s get it done! 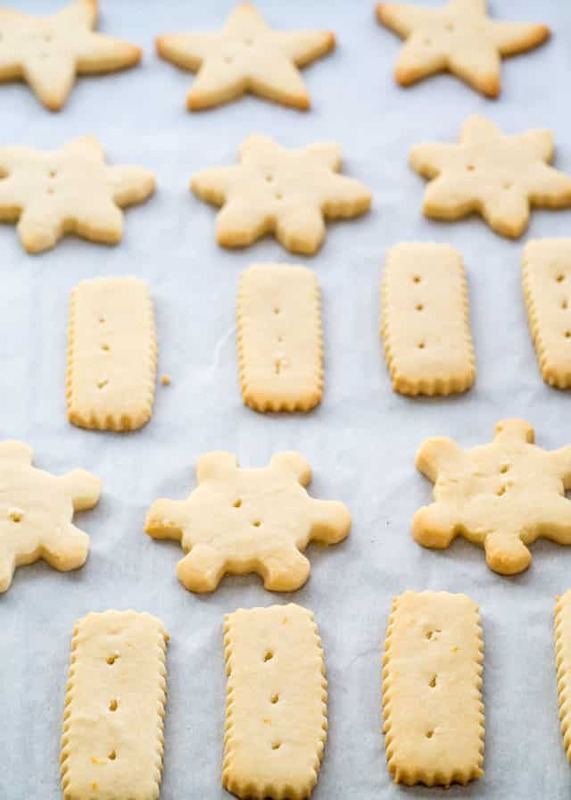 Today, I have for you the easiest shortbread cookie ever, and this is actually the same as my classic shortbread cookie recipe but loaded with lemon zest and lemon juice. I love these cookies because they only require 3 ingredients, flour, butter and powdered sugar, then add whatever flavorings you like, in this case lemon. If you wanted a chocolate shortbread cookies, just add some cocoa powder. 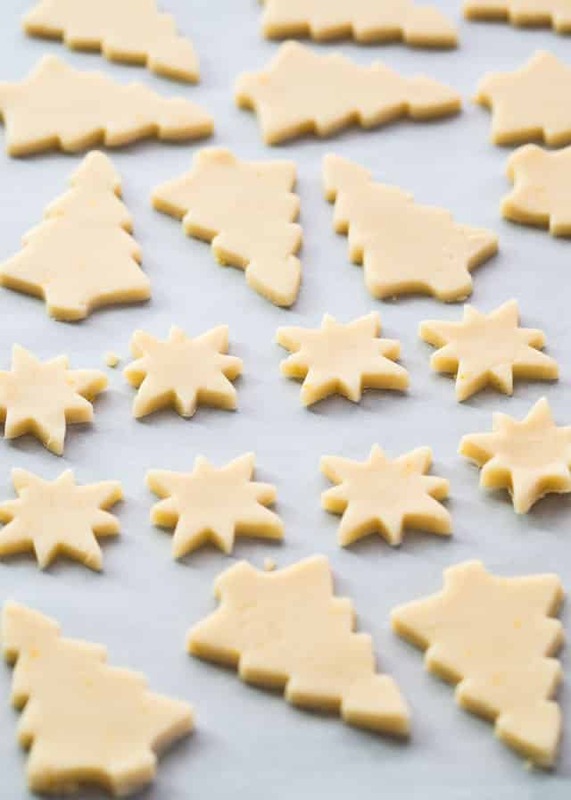 Normally I just cut these cookies using a knife, but being Christmas and all, I wanted to use all my fancy cookie cutters and cut out some cute shapes. You could also just pat the dough in an ungreased cookie sheet, bake them and then cut them, whatever works for you. These cookies bake quickly, all they need are around 12 minutes in the oven and they are done. You should have enough dough to make about 3 dozen cookies but it really all depends on how big you cut them. 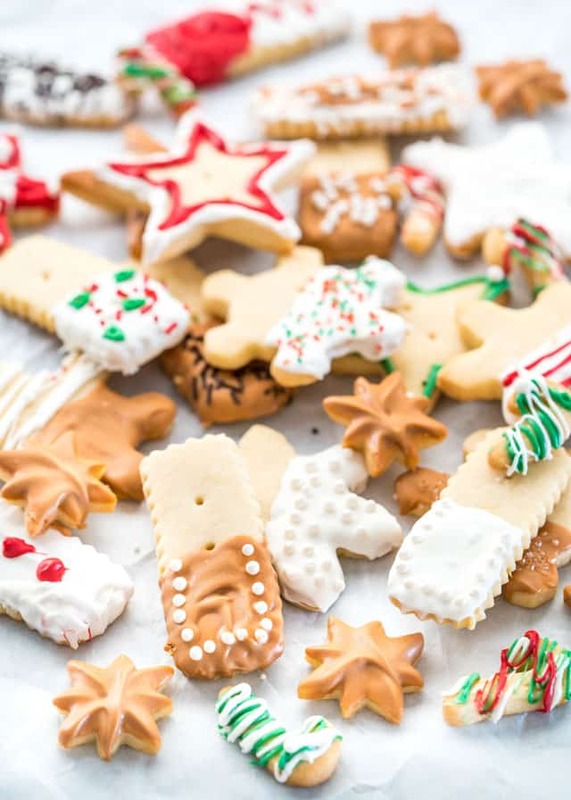 Because it’s Christmas we decided to go nuts and have some fun decorating these cookies, but you don’t have to. We decorated them with melted chocolate, white, green, red, and salted caramel, hey don’t judge. Normally I would just ice them with some lemon icing and make them all fancy and stuff, but this was about having fun. Of course, you don’t have to decorate them at all, simply enjoy them as they are because they do have a wonderful lemon flavor. Lemon Shortbread Cookies - Classic shortbread with a lemony twist. Using only 4 ingredients and festive decorations, fill your house with the wonderful aroma of Christmas just in time for the holidays. Preheat oven to 325 F degrees. 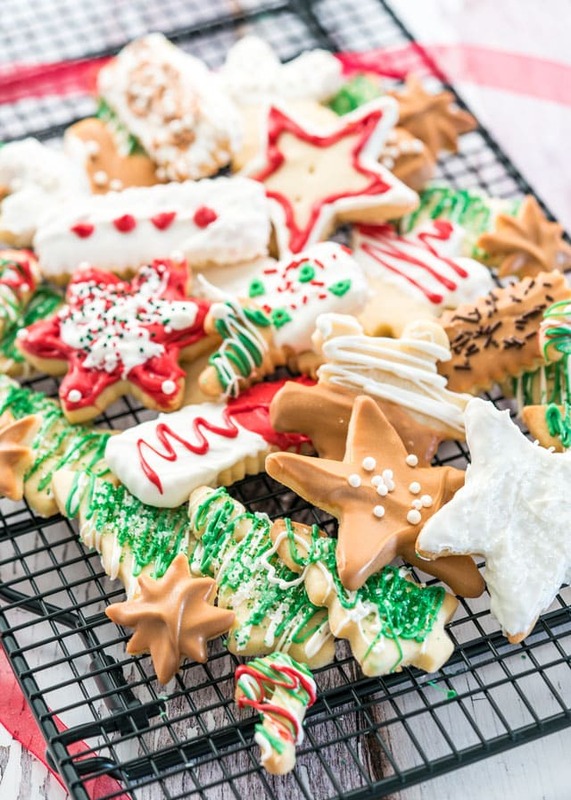 If cutting out cookies with cookie cutters, line 2 baking sheets with parchment paper. Add the butter to the bowl of your mixer and blend until smooth on medium speed. Add the powdered sugar, lemon juice and lemon zest to the mixer bowl and continue mixing on low until fully incorporated. Scrape down the sides of the bowl. Add the flour and mix until well blended. Pat dough into ungreased cookie sheet. Alternatively you can roll out the dough until it is about 1/4 inch in thickness and cut them to your desired shape. I placed parchment paper on my cookie sheet but its not necessary. Bake for 12-15 minutes until just done (slightly golden in color). Do not let it get brown. Remove from oven and let cool for a couple minutes on the baking sheet. Transfer to wire rack to cool completely. 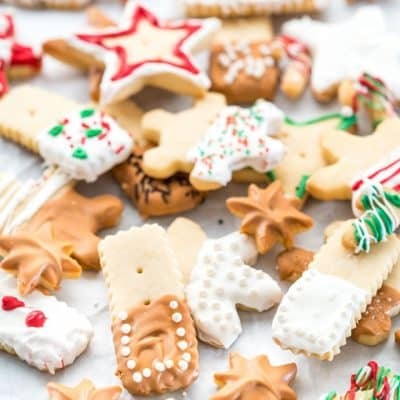 Decorate the cookies with icing and sprinkles or dip them in melted chocolate. Note: Video above is for the Shortbread Cookies which is similar. This recipe basically has the addition of lemon juice and lemon zest. You can put this dough in the fridge ahead of time if you want to bake them later. Allow the dough to warm up on the counter before rolling, to make it easier to work with. MERRY CHRISTMAS AND A GREAT NEW YEAR!!! I loved how simple and delicious this recipe. Just the right about of sweetness and melt in your mouth buttery goodness. I always reduce sugar in a lot of the recipes I find, but this one was perfect. Any tips on how to make that lovely colourful icing! I actually used Wilton Candy Melts we bought at Michael’s. They have them in all different colors. I’m going to try the lemon cookies since my son who lives in Tampa, FL sent me a case of Meyer lemons that he harvested from his backyard lemon tree. I live in NH and the concept of citrus trees in my yard instead of snow and ice is wonderful. Jo…I’m a subscriber. I subscribe to a number of cooking sites, but yours appeals to me more than any other. I’ve been cooking for almost 60 years (I’ll be 70 in May. My mama was a working mother and I started supper almost every night) so I enjoy your down-to-earth recipes. They look and taste so good. Thanks for all your hard work keeping this site going. We use Meyer lemons all the time and love them. They are so sweet and just have a different taste than others. Nice treat for you to have from your son. Thank you for being a subscriber and follower and being a part of the Jo Cooks community. Wishing you all the best over the holidays. Yummy! can’t wait to make them with my grandkids! Not necessary, I didn’t chill the dough at all, worked with it right away.